Ever wanted to play Dutch Blitz in larger groups? 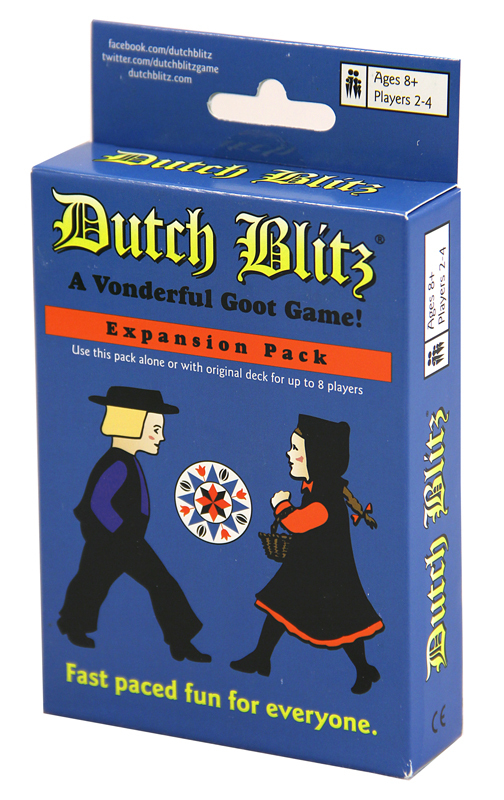 The Dutch Blitz Expansion Pack allows you to play in groups of up to 8 players*. The symbols on the back of the cards have switched colours, allowing more people to play at one time. You thought Dutch Blitz was exciting with 4 players? Let the insanity begin! During the checkout process please select the Dutch Blitz shipping option, Signed For 1st or 2nd Class or Special Delivery. Do not select the cheapest shipping option you can see because we will just refund your payment and make you re-order. If you have bought Dutch Blitz before and have lost or even destroyed a card or two, please fill out the Contact Us form and we can send out replacement cards for the price of a second class stamp. Because it is prohibited to mail playing cards to certain European countries, and we do not get compensation if they get lost in the mail, we no longer ship Dutch Blitz to Spain, Greece or Italy. *We are not responsible for any injuries players may receive when playing Dutch Blitz in larger groups.